(August 7, 2018) -- Logan Williamson dazzled on the mound and the York Revolution bullpen held off an eighth-inning rally from the New Britain Bees to take home a 5-4 win on Tuesday night at PeoplesBank Park. The game was played in under three hours but featured a 1-hour, 57-minute pregame rain delay at the start. The Revs struck first in the game on Alexi Casilla’s fielder’s choice RBI grounder to second off Bees starter Rainy Lara. Melky Mesa followed with a line drive double that short-hopped the left field wall to score Casilla from first base. Not to be out-done, Telvin Nash blasted a line drive two-run home run over the left-center field wall and the Revs opened up a 4-0 lead after three innings. The Revs added another run on Mesa’s sac fly to center in the fifth to extend their lead to 5-0. Williamson got in a groove early and continued to deal as the game went on. He surpassed his previous season high of three strikeouts by the third inning and finished the night with six. Williamson finished the night after six and one-third shutout, allowing just three hits and two walks. He faced the minimum over his first three and two-third innings and retired the Bees in order three times, while logging his fourth quality start of the season. Michael Click took over for Williamson with a man on second and one out in the seventh and retired the only two hitters he faced to preserve Williamson’s scoreless outing. Junior Rincon got the call for the eighth inning but ran into trouble. After retiring the leadoff batter, Rincon gave up a single and walked two to load the bases. Jonathan Galvez ended the shutout bid with an RBI single. Deibinson Romero followed with a two-RBI double and Jason Rogers added an RBI single to make it a 5-4 game before Rincon was pulled from the game. Joe Van Meter replaced Rincon with two outs and Rogers on first. Rogers stole second, then Van Meter walked Matt Tuiasosopo and hit Jovan Rosa to load the bases. Van Meter fell behind in the count 3-1 to Jamar Walton but got Walton to fly out to Travis Witherspoon in right-center field to end the threat and hold the Revs’ 5-4 lead. 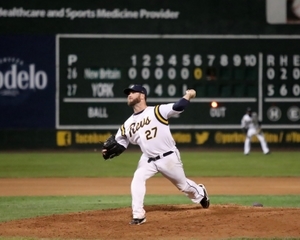 Grant Sides retired the Bees in order while striking out two batters in a much less stressful ninth inning to record his 12th save of the season and finish off the Revs win. Williamson (5-3) earned the 26th win of his Revs career and moved ahead of Frank Gailey (2015-17) into third place on the all-time list. Lara (8-5) suffered the loss for the Bees, allowing five runs on seven hits in six innings. Up Next: The Revs and Bees will play the finale of their three-game series Wednesday at 6:30 p.m. on Dance Night at PeoplesBank Park. RHP Dominic Severino (4-7, 5.64) will go for the Revs and be opposed by LHP Andy Van Hekken (4-6, 3.72) for the Bees. It is Dance Night at PeoplesBank Park. Tickets are on sale at YorkRevolution.com, (717) 801-HITS, and in-person at the Revs Ticket Office. Notes: Nash's homer is his fourth in five games since returning to York; he has 10 RBI in those five contests. Nash has now hit 48 home runs in his Revs career, third-most in franchise history. His home run in Tuesday's game was the 32nd of his career at PeoplesBank Park, moving past Chris Nowak (2011-12) for second in stadium history, trailing only Andres Perez' 38. The pregame rain delay was the ninth-longest in Revs history and fifth-longest in PeoplesBank Park history.